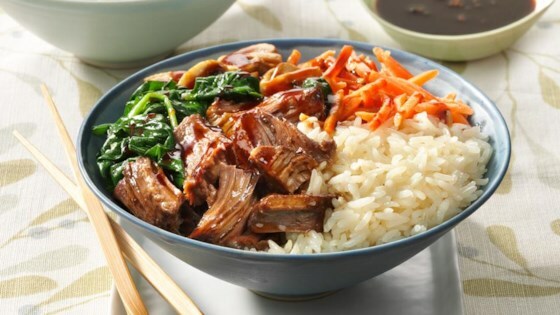 "Beef roast au jus, fresh mushrooms, and leafy spinach make an unforgettable Korean-inspired dish." In a medium skillet, heat 2 teaspoons of oil over medium-high heat. Cook and stir mushrooms for 3 to 4 minutes; transfer to a medium bowl. Stir in 1 teaspoon barbecue sauce. Keep warm. In the same skillet, heat spinach, garlic, and 1 tablespoon water for 1 minute or until spinach is bright green and reduced in size. Transfer to a serving bowl; keep warm. Add remaining 1 teaspoon oil to the skillet. Cook and stir carrots and ginger over medium-high heat for 1 minute or until carrots are crisp-tender. Transfer to a serving bowl; keep warm. The ultimate quick whole-grain rice bowl.